Enter the e-mail address associated with your account, and we'll email you a password reminder. New Customer? Register an account now. 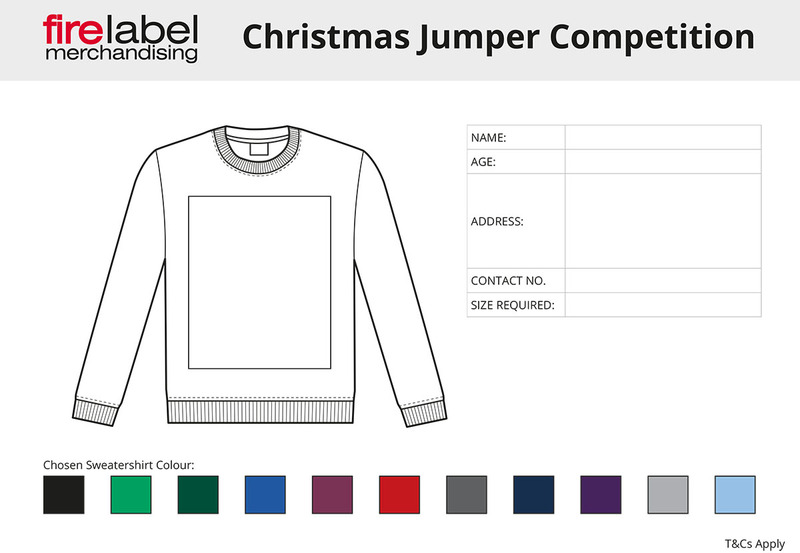 Be in with a chance to WIN a personalised christmas jumper with your design on it! We’re giving you the chance to win a Christmas jumper featuring your own design on it! All you have to do is design the best Christmas jumper EVER and send it in to design@firelabel.co.uk or drop us a private message on our Instagram/Facebook to be entered. Your design can be a drawing, digital design or even a photograph! Let your imagination run wild! On Friday 7th December the Fire Label team will pick their favourite design and announce the winner! This means we’ll get your jumper to you before Christmas Jumper Day so you can join the cause in style - all you have to do is.. well, design the best jumper of course! It will be a great conversation starter at the Christmas party or even the best Christmas present for your Nan! Below is our template that you can use if you wish! It shows the max print area (330mm x 400mm for adults and 200mm x 240mm for children) and the colours of sweatshirt that are available to you! So get designing to be in with a chance to win the coolest, most festive Christmas Jumper of the year! 2)The competition is open to all-comers aged 18 years or over, except employees of Fire Label Merchandising Ltd, their close relatives and anyone otherwise connected with the organisation or competition. a) Parents or guardians can submit entries on behalf of under 18’s. 3) By entering this competition, the entrant is indicating his/her agreement to be bound by these Terms and Conditions. 4) Only one entry will be accepted per person. 5) The competition will begin on 30th November at 19:00. Closing date for the competition will be: 7th December at 16:00. No further entries permitted after this date/time. 6) Fire Label Merchandising Ltd cannot accept responsibility for entries/orders not received for whatever reason. a) Send your entry (using the design template or your own format) to design@firelabel.co.uk or via private message on our Facebook / Instagram. b) Please indicate your name, contact number, preferred colour, size and product code on the entry form. c) The draw will be completed by a member of our team at 16:30 on Friday 7th December 2018.
d) The winner will be announced through Social Media and on our Website no later than 17:00 on Friday 7th December 2018. 8) The promoter reserves the right to cancel or amend the competition, and these terms and conditions without notice, in the event of a catastrophe, war, civil or military disturbance, act of God or any actual or anticipated breach of any applicable law or regulation or any other event outside of the promoter’s control. Any changes to the competition will be notified to entrants as soon as possible by the promoter. 9) The promoter is not responsible for inaccurate prize details supplied to any entrant by any third party connected with this competition. 1 x Russell Authentic Sweatshirt (adult code 262M / children’s code 762B) with the winning design printed with DTG process on the Front Centre. The prize is as stated and no cash or other alternatives will be offered.The prize is not transferable. Prizes are subject to availability and we reserve the right to substitute any prize with another of equivalent value without giving notice. 11) If the winner cannot be contacted or does not claim the prize 12:00 on Monday 10th December 2018 we reserve the right to withdraw the prize from the winner and pick a replacement winner. 12) The promoter will notify the winner when the prize is to be delivered. Delivery should be within 4 working days of first contact with the winner to determine size and colour requirement and will be shipped to the winner’s usual delivery address. a) We cannot be held responsible if, for any reason, we are unable to meet the delivery date of 14th December. 13) The promoter’s decision in respect of all matters to do with the competition will be final and no correspondence will be entered into. 14) The competition and these terms and conditions will be governed by English law and any disputes will be subject to the exclusive jurisdiction of the courts of England. 15) The winner agrees to the use of his/her name and image in any publicity material. Any requested personal data relating to the winner such as address, telephone number and email will be used solely for this competition and in accordance with current UK data protection legislation (GDPR), and will NOT be disclosed to any third party. Sign up to our newsletter for our latest news and offers. Keep up to date with latest news and offers from Fire Label by joining our mailing list. Copyright © 2013-2016 Fire Label Merchandising Ltd. All Rights Reserved. VAT No. 975503792. Company No. 6979227. Unit 4 The Triangle, Wildwood Drive, Worcester, WR5 2QX, UK. All prices exclude VAT.